This is an original Gouache Painting from inside the Soviet Union painted during 1978. The artist, I. Rodionov, painted a small number of war-time paintings during the 1970s, each one based on the actions he experienced whilst serving in the Soviet Navy during theSecond World War. 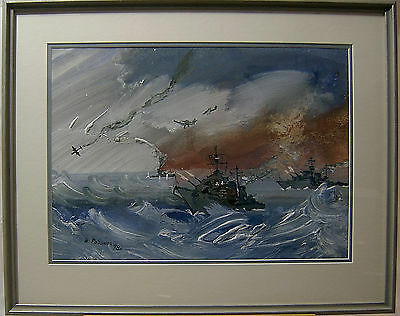 I have managed to locate 2 of these gouache paintings which are now offered for sale. 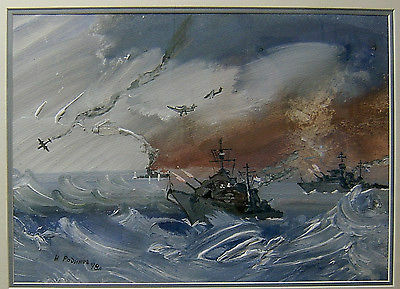 The pictures depict a sea and air battle which tookplace around the Archangel Dockyard, when German forces were intent on preferably taking this strategic port, also a berth for the Soviet submarines ordestroying it beyond further use. They failed. Each has been professionally mounted, framed and glazed in England using Artcare board to prevent possible future moisture degradation. This painting measures 16.75 inches (42.5 cms) x 21 inches (53 cms) framed with the painting itself measuring 11.25 inches (28.5 cms) x 15.75 inches (40 cms). I would be willing to discuss selling them as a pair, if of interest. UK standard postage is FREE. International postage - please ask for a shipping quote before ordering.